Before 1906 the only frictions hot enough to kindle a bit of war planning had arisen from suspicions that Tokyo coveted American islands. In the 1890s many Japanese laborers had emigrated to the Hawaiian republic, which was virtually a U.S. protectorate. When Japanese warships came snooping around, Roosevelt, then assistant secretary of the navy, solicited from his officers a plan of defense in case a need should arise to intervene against a claim by Japan. The U.S. annexation of Hawaii in 1898 put such anxieties to rest. In the Social Darwinian atmosphere of the time it seemed plausible that Japan also hungered after the Philippine Islands as a place to resettle its burgeoning population. There was shadowy evidence that Japanese secret societies aided a native insurrection against U.S. rule in the Philippines. Japan’s covetousness of Blue possessions was customarily mentioned in Orange Plans as a cause of tension, but the strategists never seriously believed it would foment a war to commandeer such resource-poor archipelagos when far richer prizes in East Asia could be plucked with far less peril. War Plan Orange was inaugurated by a trivial incident. Between 1891 and 1906 thousands of Japanese emigrated to California. Local white racists agitating to block their entry unfairly stigmatized them as “immoral, intemperate and quarrelsome men bound to labor for a pittance.” They victimized Orientals by looting and violence in the tense aftermath of the earthquake and fire that devastated San Francisco in April 1906. Politicians passed laws restricting property rights and segregating schoolchildren—laws that violated treaties. The proud people of Japan were outraged. The American press, the “leprous vampires . . . eager to involve their country in war to sell a few more newspapers,” in the words of Secretary of State Elihu Root, brandished lurid tales of menace by the warlike Nipponese who had whipped the czar’s legions. Roosevelt’s administration calmed matters by coercing bigoted city officials to repeal the measures and negotiated a “Gentlemen’s Agreement” whereby Tokyo curtailed the flow of immigrants. But anti-Oriental riots broke out in the spring of 1907, and another “war scare” hit the headlines. So taut was the atmosphere that the Naval War College staff began to ponder a Blue-Orange war scenario. The Second Committee cobbled together a rough plan featuring “preliminary steps to be taken . . . when war is imminent.” Even the president became unnerved. A few months earlier he had asked if the navy was studying how to fight Japan. Dewey had told him that the General Board had prepared an “effective” Orange Plan. The Joint Board briefed him on it. Roosevelt never believed that bigotry and journalistic jingoism could incite a war. Neither did the naval planners, who saw that Japan was absorbed in digesting its conquests in Manchuria and recovering from financial exhaustion. The scare blew itself out by the time the American fleet paid a goodwill visit to Tokyo in 1908. U.S. planners regarded the vigilante flare-ups on the West Coast as “pin pricks” that Japan would exploit for public agitation and world sympathy, not realistic inducements to war. In 1913 the “yellow press” of both countries again stirred up wrath after the California legislature barred Orientals from owning land. Again the administration urged moderation, but this time President Woodrow Wilson discouraged warlike planning. Angered at plotting of steps for mobilization behind his back, he suspended the Joint Board from all war-planning activity. The scare evaporated. Racist incidents soon faded as a motivation for planners. When the United States passed an immigration act in the early 1920s that excluded most Orientals and provoked bitter feelings in Japan, the strategists took little notice. Nevertheless, the legacy of the bigotry of 1906 was profound because it set the United States to planning war against Japan. A viable war rationale was identified when the planners scrutinized their country’s most prominent Far Eastern policy. The prospect of a lush Chinese market had long captivated American government and business leaders. It had also motivated McKinley to keep the Philippine Islands as a colony after the war with Spain for a commercial entrée to the Orient. But European powers were carving the moribund corpus of Manchu China into exclusive spheres of commercial dominance and preempting Chinese ports as naval bases. The most avaricious imperialists were Germany, France, and Russia. In 1899 Secretary of State John Hay appealed to all nations to preserve free trade throughout China. The following year, after several powers (including the United States) squelched the Boxer uprising of Chinese nationalists against foreigners, the feeding frenzy intensified. Russia virtually annexed the rich province of Manchuria. Hay expanded his plea, asking all states to honor the political integrity of China. The commercial and political appeals, together named the Open Door policy, were popular with Americans for idealistic and practical reasons. With unwarranted confidence, Hay (who joined Roosevelt’s cabinet after McKinley was assassinated) assumed that the great powers had assented to America’s self-appointed stewardship of the status quo in Asia. Along with the Monroe Doctrine, the Open Door was, Mahan declared, one of the “principal and permanent policies” on which naval planning would stand. Before the Russo-Japanese War of 1904–5, U.S. planners had searched for ways to maintain the Open Door against predators. It was clear that an isolationist America with a minuscule army could not enforce its high-minded dicta against continental powers like Russia. It needed strong friends in the region. Great Britain and Japan appeared friendly for they were sated for the moment, the former with its vast Eastern empire and the latter with Formosa and Korea, the spoils of its 1894–95 war with China. 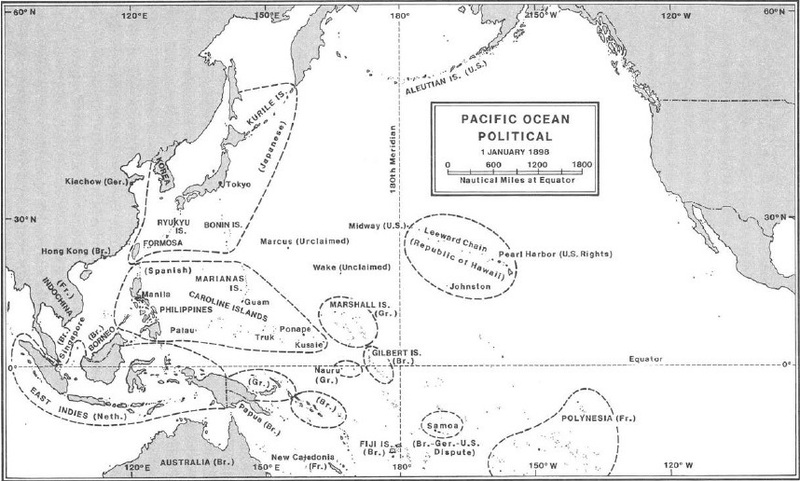 The British-Japanese alliance of 1902 was applauded in the United States as a stabilizing alignment that would support the Open Door. The General Board therefore set about concocting scenarios of coalition struggles in the Far East that it assembled into War Portfolio No. 2, a collection of vague plans and harbor charts. Rear Admiral Henry C. Taylor, Dewey’s right-hand man, mesmerized his colleagues with melodramas that usually pitted the United States and the Anglo-Japanese alliance against a sinister cabal of Russia, Germany, and France. (His naval wars somehow never spread beyond the Orient.) Rear Admiral Frederick Rodgers of the Asiatic Station responded unenthusiastically. When pressed, he grudgingly produced a plan to send his thirteen warships from their rudimentary base at Manila to wreck the weakest opponent, the French squadron, and occupy its Indochinese ports to secure his communications via the Indian and Atlantic oceans. He would then join the larger allied fleets in bottling up the German and Russian squadrons in North China and Siberia. When Rodgers’s successor refused to dabble further, the Second Committee and the War College pecked away desultorily at other sketches. Taylor’s studies, though detached from political reality, bequeathed certain legacies to Plan Orange. They envisioned primarily naval contests with little need of Blue ground forces. They emphasized the importance of distant naval bases. A battle-worthy squadron, Taylor declared, would need an industrialized dockyard in the Philippines. Since it would not be able to range as far as the Yellow Sea, it would also need mobile or “flying” bases for replenishment and light repair. The General Board speculated on obtaining a coaling base in China but soon acknowledged that acquiring one in peacetime would be provocative to opinion abroad and that the U.S. government would not sanction it. (Rodgers slyly suggested a permanent anchorage in Korea, which Japan was hardly likely to grant.) During a war, Blue would have to improvise mobile forward outposts, for which the navy began accumulating matériel in the Philippines. Such bases, the board decided, ought to lie conveniently near the fighting zone yet rearward enough to require only portable defenses against light raids. These criteria for advanced bases permeated Blue strategic thinking in the ensuing decades.